Each year Harris Ranch produces over a half million rib roasts, many of which end up as steaks on our backyard grills. One of the most popular cuts in the summer is the Rib Eye steak. This cut comes from the lightly worked upper rib cage area, and tends to have good marbling, or flakes of fat within the lean muscle, which helps make beef more juicy, flavorful and tender. 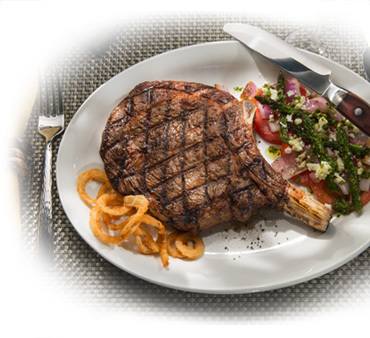 Harris Ranch has been producing the highest quality and most consistent beef for over 50 years. Not many beef companies can truly claim they control all aspects of production, but Harris Ranch has built a uniquely integrated company where they control cattle sources, feeding and humane processing. Harris Ranch’s beef cattle spend about 85% of their lives grazing on western ranch lands before being finished on a nutritionally balanced diet of corn and other feed grains, plus alfalfa hay, vitamins and minerals. This helps add tenderness, flavor and juiciness to all Harris Ranch beef products. When it’s time to indulge and grill a Rib Eye steak, Harris Ranch Beef recommends using a charcoal grill and lighting the briquettes 30 minutes in advance. Begin grilling when coals are covered with a light ash and are no longer flaming. Coals that are too hot can cause beef to overcook on the outside before the interior reaches the desired doneness. It is best to use a good meat thermometer placed in the center of the steak is best for accuracy. Remember the temperatures will rise a bit once you take the steak off the grill to let it rest. If you don’t have a meat thermometer, feel it with your fingers. If the steak is very spongy it will be rare. Medium will have a firmer feel and well done will be very firm. A 1-inch thick Rib Eye steak can be cooked to medium rare in about 10 – 15 minutes, or about 5-7 minutes per side. Turn the steak with tongs or a spatula, never a fork, which pierces the beef allowing flavorful juices to escape. Here is a classic rub created at the Harris Ranch Inn & Restaurant that will add great flavor to a Rib Eye steak, or any other cut of meat. Combine all ingredients and store in an airtight container. Rub generously over the exterior of Rib Eye steaks before grilling. Enjoy!